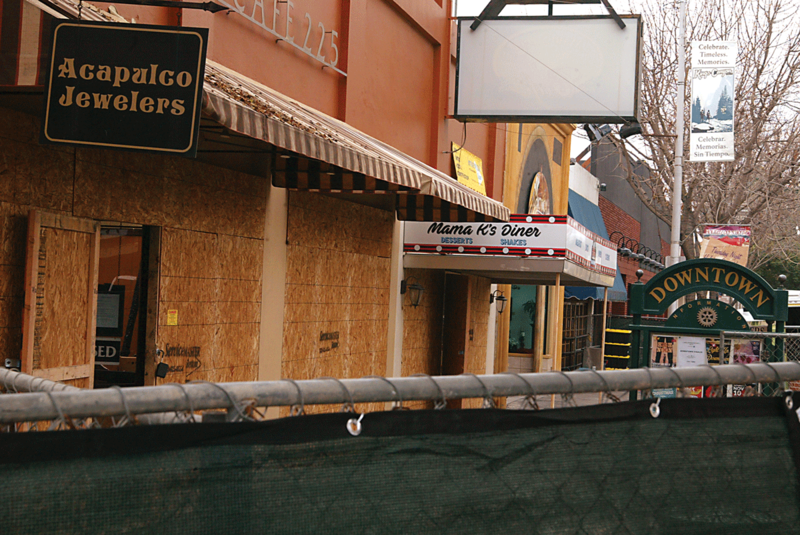 VISALIA – Downtown Visalia businesses have come together this week to raise money for employees displaced by the Dec. 26 fire that destroyed or damaged six business on Main Street. In the middle of the night on Dec. 25-26, a fire started in the kitchen of Mamma K’s Diner, 233 W. Main St., and spread quickly through the attic which was shared with two adjoining businesses in Café 225, located at 225 W. Main St., and Acapulco Jewelers, 221 W. Main St. The three-alarm fire caused extensive damage causing the building’s entire roof to cave in. The fire affected three other businesses. Pacific Treasures, 219 W. Main St., had significant smoke damage while Exotica Hair Studio, 301 W. Main St., and Little Italy Restaurant, 303 W. Main St., both sustained water damage. More than 20 businesses in the downtown responded to the relief effort by agreeing to hold their own fundraisers by providing specials, hosting events, collecting donations, hosting raffles, and more. This week kicked off with the Cellar Door and Sound N Vision’s Benefit Concert on Jan. 20. All of the $10 suggested donation at the door as well as raffle tickets for prizes donated by Velouria Records, benefitted the fire relief fund. The giving continues today, Jan. 23 at the The Planing Mill Artisan Pizzeria. Dubbed “Pizza with a Purpose”, 25% of all sales between 5-8 p.m. will be donated. On Thursday, Jan. 24, Visalia Fox Theatre will be showing “Moonstruck” (1987) as its Benefit Movie at 6:30 p.m. Tickets are $5 and are available online at foxvisalia.org or by calling the box office at 559-625-1369. The first 100 guests will also receive free popcorn. Panini Nut House will donate 25% of all of its sales on Friday, Jan. 25 including bagged nuts, dried fruits, and sweet treats. Downtown Rookies will be offering drink specials on Jan. 25, 26, and 27 with $1 of every special drink purchased being donated. Other businesses are holding their fundraisers all week long. Now through Friday, Brewbakers Brewing Company will give 50 cents from every dessert item, Michelada, and Hop Local IPA pint purchased. A&W’s downtown location will donate $1 of every combo meal sold. Akari Skin & Body Care is donating 50% of gift certificate proceeds purchased during the week. Sol Bol will give 5% of each signature Bol purchased during lunch hours (12-2 p.m.) to the cause. Component Coffee Lab and Quesadilla Gorilla will donate 5% of all sales for the week. Gourmet Desserts and Wedding Cakes, Alejandra’s Mexican Restaurant, and Joshua Tree Boutique are donating 10% of all items sold now through Saturday, Jan. 26 or Sunday, Jan. 27. The list of participating businesses is growing so Downtown Visalians encourages customers to keep checking back for more ways to give. As of press time, Sequoia Brewing Company, P.S. I love you too, Visalia Rawhide, Ziaya’s, Henry Salazar’s, and Visalia Brewing Company have yet to announce their fundraisers. You can also donate to the Downtown Visalians’ GoFundMe page titled Downtown Visalia Fire Relief. The site has a goal of $10,000 and had raised just under $1,200 as of press time. For more information, contact Downtown Visalians by emailing info@downtownvisalia.com or by calling 559-732-7737.